If you are interested in joining Shinsengumi Rebirth. -People only looking for "help"
We also look for people who have some knowledge on Bushido and samurai history, rather then Skillchain charts, armor, and level. The game really only requires time. No real personal skill but maybe timing on pressing buttons and reading chat logs. In SR we offer to have people play different ways of Samurai. We will help with AF equipment and give you advise for playing samurai better. Although we will stress on the moral code of samurai and history of samurai. Our goal is only to restore the 'good' within our server, for it lacks much of it. People are very greedy and just want to be level 75 and gil, but they miss all the experiences that come before leveling, money, and missions. If you are interested in joining a unique and fun LS, try our LS out. 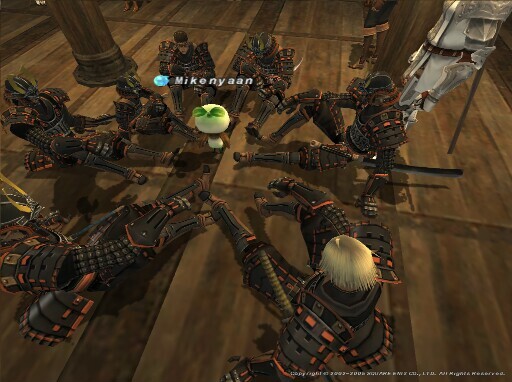 We do require you to be on Odin server and of course, have Samurai job. Higher level samurai help because they are able to aid other in their tips from experiences and aiding in quest. Equipment and money does not interest me, just prooves to me you have more time then others. Skill, you can press buttons, good for you, so wouldn't really help you to get into SR. Knowledge on samurai history or moral beliefs is something that will definately help because we like to understand the samurai beyond the polygons. I would require that you fill out a form at the end of this page, or /tell me in-game. Thank you for showing interest in joining our LS!